The sport of Gliding is one of the most exhilarating ways of getting in the air. The sensation of floating in the air in almost silence is an unforgettable experience. It is also one of the most cost effective ways of learning to fly. Our trial flying lesson is a brilliant introduction and is ideal for almost anyone. Age is no barrier, we have flown visitors from early teens to their 90s. Your trip will start with a briefing by one of our fully qualified flying instructors who will explain all of the safety aspects of your flight and also introduce you to the aircraft and make sure you comfortable. 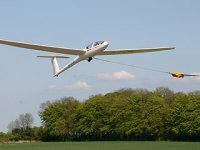 The glider will then be winch launched to a height of up to 2000 feet from where you really can get a bird's eye view of the Cotswolds; an area of outstanding natural beauty. The flight will generally last about 10 minutes but can be longer if the weather conditions permit. The voucher supplied is valid for twelve months from purchase and is non-refundable. It entitles you to one flight on either a Saturday or Sunday, weather permitting. Full instructions for booking will be supplied with your voucher.